If you’re looking for a little extra inspiration for your Christmas gift purchases this year, look no further! With just a few weeks to go, some of you will have made your purchases already, but if you’re still hoping for ideas before you hit the shops or the internet, hopefully this will help you. My eldest daughter is almost 11, and very much a ‘Tween’ now. She’s also a gadget loving girl, just like her parents, so her if you’ve got one like that, read on. I just love this very cute little bluetooth speaker and know my Tween is going to love it too. She loves her music, gadgets and design, so this delightful speaker is just spot on for her. I may have had a sneaky play with it already, and it makes a lovely sound. From new audio brand KAKKOii, the collaboration with Pantone adds to the Qb range, and proved very popular at Design Junction last month. They are available from KAKKOii for £45. If you have a tween daughter with long, unruly hair this could be just the gift for her. At the push of a button an ion jet releases millions of active ions creating a halo around your hair. Active ions work very much like a conditioner taming frizz and flyaway hair. I’ve given this a go and it really does work! It’s a great gift for the girl who’s getting interested in her appearance, and is available from Amazon for around £29. I can’t wait to give her this one, I know she’s absolutely going to love it. First News is the newspaper for kids full of topical, relevant news pitched at just the right level. It’s the UK’s only newspaper for young people and the widest-read children’s publication in the country with a readership of 2,042,199 seven to 14 year olds every week. She has access to it at school from what I understand, but will love having her own copy. A 6 month subscription of First News costs £32.99 with lots of options and variations available. This is a great idea for a music and gadget loving tween, either a boy or girl and it’s not something I’d seen before. An albumcard is a personalised greeting card and digital music download all in one. All costing just £9.99, you can select from the range, have the card personalised and sent to your recipient. Once opened, a code allows you to download the album. I’ve chosen Ed Sheeran and Sam Smith for my tween and I know she’s going to be really pleased. You can see the full selection here, where I understand, more are being added all the time. Don’t these look cool? My tween is forever on her iPod listening to music and I know the smaller in the ear headphones hurt her after a while, so I think she’s going to love these bigger bluetooth versions from Jam. Rechargeable with up to 6 hours play, the wireless bluetooth headphones work from up to 30 feet away. They even have an integrated microphone for taking phone calls on the go. I think I may be borrowing these! Available from HMV for £59.99. 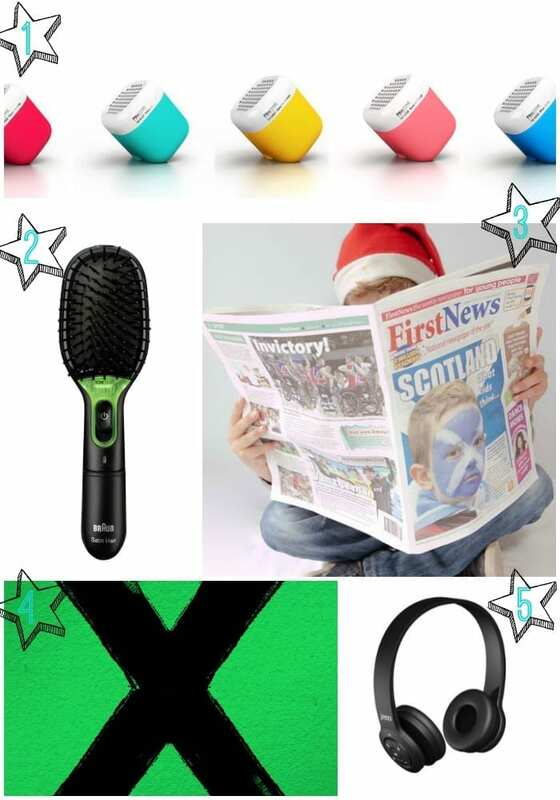 What do you think of these Tween Girl Christmas Gift ideas? Have you bought anything similar for your Tween yet? Next Post How Much Does Christmas Cost? Love the look of the speakers and the headphones! Might have to add them to my list (although I’m not a tween!). ooh i coul do with that hair brush in this house!